A former Marine is accused of murdering four homeless men and a woman and her son in California. 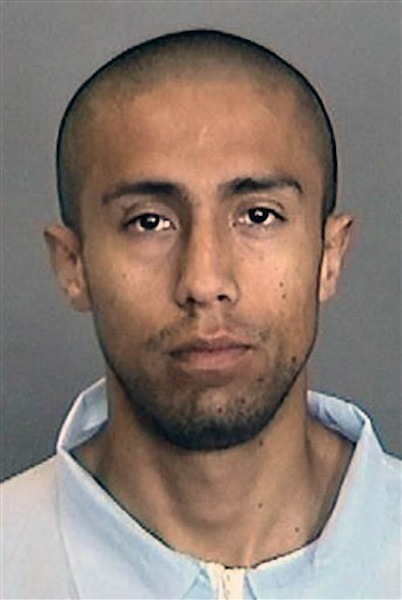 SANTA ANA, Calif. — Prosecutors will seek the death penalty against a former Marine accused of murdering four homeless men and a woman and her son in California, authorities said Monday. Itzcoatl Ocampo, 24, is awaiting a Sept. 10 trial on six counts of murder with special circumstances of multiple murders and lying in wait. Ocampo, who has pleaded not guilty, was discharged from the Marines in June 2010. He is accused of murdering a school friend’s mother and brother in October 2011, and four homeless men between Dec. 20, 2011, and Jan. 13, 2012, in Orange County. Most of the victims were stabbed dozens of times. The district attorney’s office has described the homeless slayings as a serial thrill-kill spree. A grand jury transcript released in March says Ocampo told investigators he planned to kill 16 people to follow in the footsteps of University of Texas tower killer and fellow former Marine Charles Whitman. He said he felt the need to kill after he was confined to driving a water truck and a dirt truck on a military base in Iraq, the document states. A police detective testified that Ocampo said he entered the Marine Corps with the purpose of seeing combat and becoming a killer and that in order to become a real Marine he needed to kill. The first victims were Raquel Estrada, 53, and her son Juan Herrera, 34. Ocampo, who lived a mile from them at the time, was a middle- and high-school friend of Eder Herrera, the victims’ son and brother, respectively. The bodies of the mother and son were found on the floor of their Yorba Linda home on Oct. 25. Estrada’s body had more than 30 stab wounds and Juan Herrera’s body had been stabbed more than 60 times. Prosecutors said DNA linked Ocampo to the crime. Ocampo then selected, planned and stalked the four homeless men, the district attorney’s office said. James McGillivray, 53, was slain the night of Dec. 20 behind commercial buildings in Placentia as a surveillance camera recorded the scene. The assailant, wearing a hooded sweat shirt, kneeled on McGillivray’s chest and struck him on the head and upper torso as the victim struggled. McGillivray was eventually stabbed more than 40 times. Late on Dec. 27, Lloyd “Jimmy” Middaugh, 42, was stabbed more than 50 times while taking shelter in Anaheim on the Santa Ana River Trail at State Route 91. Three days later, Paulus “Dutch” Smit, 57, was fatally stabbed more than 60 times near the Yorba Linda public library. A multi-agency homeless homicides task force was formed the next day because of the similarities of the three killings. On Jan. 13, John Berry, 64, was approached in Anaheim by an assailant in a dark hooded sweat shirt. Berry was stabbed several times and died, but witnesses saw the attack and chased the assailant. Police set up a perimeter and arrested Ocampo. Prosecutors said he had blood on his hands and face.